AFC is p leased to support the 70th anniversary celebration of Florence Li Tim-Oi’s priesting at a special service at St James’ Cathedral in Toronto on Saturday, January 25th at 3:00 pm. This service also celebrates 38 years of women’s ordination in Canada. The Most Rev Fred Hiltz, Primate will bring greetings. The Rev Canon Dr Judy Rois, Executive Director of AFC will be the guest preacher. 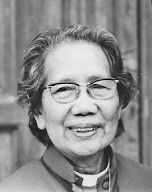 Tim-Oi was the first female Anglican priest ordained in 1944 by Bishop Ronald Hall. The Anglican Foundation donated to her 1996 autobiography: Raindrops of my Life. INTRODUCING NEW HOPE BEARS FOR 2014!